Home of: YOUR LIVING LEGACY: How Your Parenting Style Shapes the Future for You and Your Child. A book on how to empower yourself to be a more effective parent and have quality relationships with your children. Self-Empowerment: To become stronger and more confident, especially in controlling your life and claiming your rights. (from Oxford Dictionary) When you empower yourself, you create the foundation and build the skills to improve your other relationships. Learning more about You, the only person you spend 24 hours a day, 7 days a week with, is the key to self-empowerment. 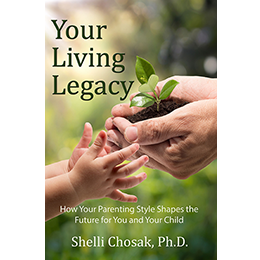 “Your Living Legacy” has been awarded First Place in the 2016 CIPA EVVY Book Awards for the category, “Family And Relationships,” and Third Place for the category, “Self Help”; Finalist in the Readers’ Favorite Book Awards; and Winner, San Diego Book Awards for the category: Self-Help/Psychology.